Fix “This Publisher has been blocked from running software on your machine. You must unblock this publisher to run this software”, ever came across this error in Windows 10, 7, or 8.1 running PC? This security warning occurs when you try to open any file or try to run a software specifically. The software could be anything including a USB driver for your smartphone. Now the error does not occur with all the programs at the time of installation but is restricted to only a few programs. What more amazing is that there is no real solution to this problem, but all you can do is try different solutions with a hope that one of them may just work for you. If you click on “How do I unblock this publisher “ link given in the security warning window, you will be taken to Bing search where you can try to enter the query and find any available fixes for this problem. In this post, I have listed all the possible solutions to fix “this publisher has been blocked from running software on your machine. You must unblock this publisher to run this software”. As I said earlier, there is no actual solution to this problem, but you can try the following solutions to fix it. Update: As reported by some of the readers, step 6 seems to be the working solution for most of them. So, directly jump to the Step 6 and see if that fixes this error before you try any other steps in this post. To fix this error, you can check and remove your publisher from Untrusted Publisher list in Internet Options if any. Follow these steps to know how to unblock a software, publisher. 1. Open Internet Option. You can access Internet Option either from Settings or Internet Explorer Settings. To access Internet Option from Settings, go to All Settings by clicking on Start and selecting Settings. Open Network and Internet from the options. 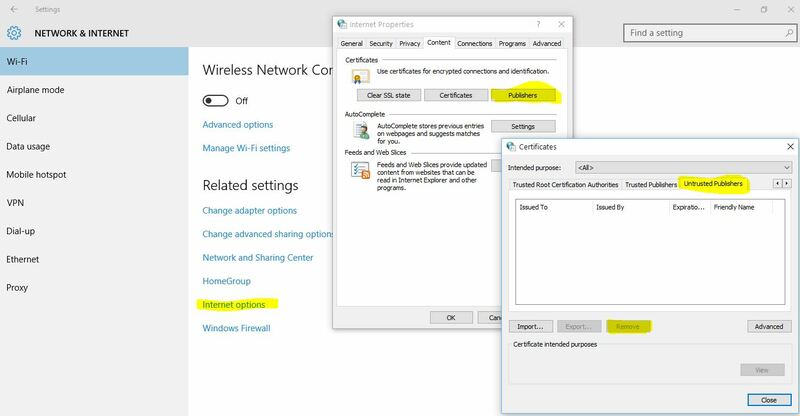 Under Network and Internet, click on WiFi tab or Dial-up tab, and then click on Internet Options under Related Settings section. 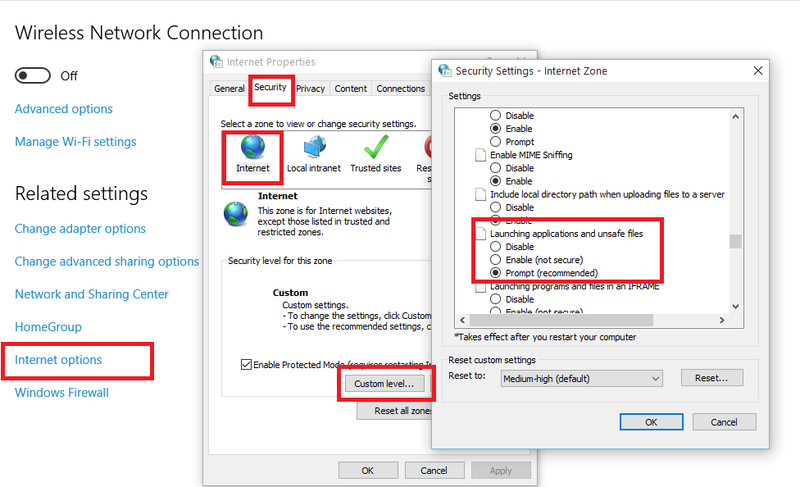 To open Internet Options from Internet Explorer, click on Tool button and then click Internet Options. 2.Once the Internet Options window pop-up, go the to the Content tab and click Publisher button. 3. From Certificates window, click on Untrusted Publishers tab. 4. Here you should see your software publisher listed. If it is listed, click on it once and then click on Remove button to unblock the publisher from untrusted publisher list. Now try to run the software, which was giving security warning and see if the error has been resolved. 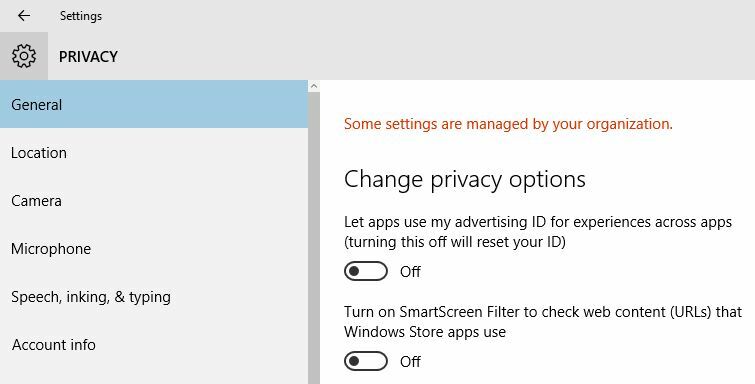 Did you try turning off Smart Screen Filter in your Windows 10 or other Windows version running PC? Turning Off Smart Screen filter can solve “ This Publisher has been blocked from running software on your machine. You must unblock this publisher to run this software” error. Follow these steps to know how to do it. 1. Go to All Settings from Start button > select Settings. 2. Click on Privacy (Location, Camera). If the above method didn’t work for you then, try turning Off the firewall on your PC. To Turn off the Firewall, go to Control Panel > System and Security > Windows Firewall and click on “ Turn Windows Firewall On or Off” from the left pane. Now Turn Off Firewall from Private and Public Network Settings. Click on OK to save the Settings. Try to run the software again and see if it has fixed the issue. If you have been trying to run software or driver made for Windows 7 version and getting this error, then you may need to download driver or software made to run on Windows 8 or Windows 10. So, download Windows 8 or Windows 10 version of your software and try to run it. Now if for some reason, the publisher you want to unblock is not listed in untrusted publisher tab, then the first method is of no use to you. However, you can try to disable security warning from Internet Options and then Disable UAC using third-party software. Here is how to do it. 1. Go to Internet Options from Settings or Internet Explorer settings. 2. From “Internet Options” window, go to Security Tab and then click on “Internet”. 3. Next, click on Custom Level button. 4. Now scroll down and find “Launching Applications and Unsafe Files” option and Enable it. If you get a security warning saying your PC is unsafe, don’t worry you can revert the changes anytime. 5. Now if you try to run the software again, the security warning saying “This Publisher has been blocked from running software on your machine” should not pop up. However, you will see another warning message saying “ This app has been blocked from your Protection”. 6. For this, you need to disable UAC. We can disable UAC, by downloading a utility called Disable UAC from here. 7. Install Disable UAC in your PC and run it. Now, check or Tick Disabling UAC (User Account Control). Click on Apply button and restart your PC. 8. After the restart, try to run the software again and this time, you should be able to run the program or install it without any error. 9. Once the software has been installed, you can enable the UAC on your PC, by running and unchecking Disable UAC. If nothing seems working, try to run the blocked program using the command prompt. Open elevated command prompt (Command Prompt as Administrator). To open the command prompt go to c:/windows/system32, right click on cmd.exe and select Run as Administrator. In the command prompt, go to the directory where your file has been located. For example, if you have it in the download folder, type cd/user/your username/downloads and hit enter. Next, enter the name of the file that you want to run and hit enter. This should allow you to run the program without any error. You can also try to unblock your file from the properties. Right-click on the installation file on which you are getting the Publisher has been blocked from running software on your computer error and select Properties. At the bottom of the properties window, click “Unblock”. Now try running the file again, and you should be able to fix this error. The Windows 10 comes with a feature called Developer Mode. Having the Developer Mode enabled allows you to install apps from the third-party sources. 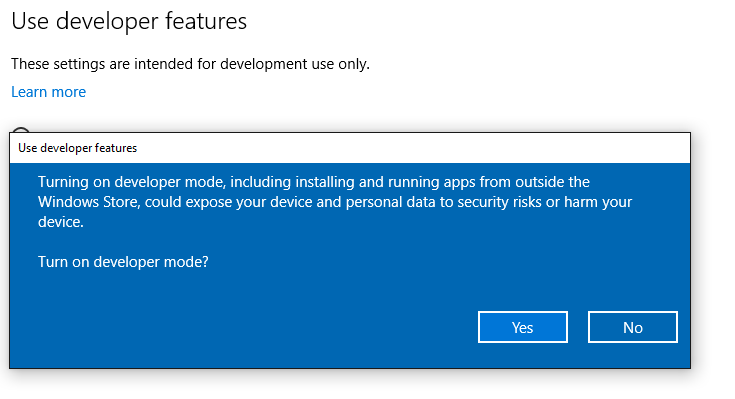 To enable Developer Mode in Windows 10, go to All Settings >> Update and Security >> For Developers. Next, click on Developer Mode and click OK to enable it. As the message reads, installing third-party apps may harm or expose your personal data to security risks. So, make sure that you trust the source of the app, before installing it. I was trying to install the Samsung Galaxy drivers, which were downloaded from Samsung’s website. I spent a whole day, trying to get it work. I tried all your fixes. The only one that worked was fix 6, “Run the program using cmd prompt”. Glad this worked for you and thanks for confirming the fix that worked for you. the easiest way! really works!!! I also found Step 6 worked straight away, but none of the other steps helped. Best to go straight to step 6 at the beginning and skip the rest, especially as some of the others leave your PC more vulnerable. yes, step 6 was the way to go. I copied and pasted the parts of the command line in order to get the exact address. Thanks. Looks like Sumsung has been untrusted. I had issue with printer driver. Only running from cmd worked. Step 6 all the way! Thank You! Step 6 was the winner for me too. Thank you. Step 6 worked to allow me to install driver for my DWA-192 wifi receiver from D-Link. As Raymond said. Step 6 working for me. Im running on W10 x64 enterprise. thanks man, Step 6 worked for me when installing Samsung Drivers. Cheers!!! Thanks Tashreef – option 6 also worked for me, but I think the fault lies with Samsung. I have an old Tab 2 10.1 and downloaded the Kies setup file for that tablet from their site. When I right click on Properties for that file, then select Digital Signatures and then Details it shows that the certificate expired on 22/12/2013! Perhaps Windows 10 is doing more rigorous checking. I don’t know if more recent versions of Kies also have this problem, but I don’t dare install the latest version in case it’s incompatible with my old tablet and I have to start again. Step 6 worked for me as well. Thanks a ton! This was a very frustrating issue. Needed to install an HP audio driver. Now I can finally hear audio from my front headphone jack!!! Step 6 worked to allow me to install samsung program for my phone. Solution 6 is a solution! Cool thanks, step worked for me too! God, I hate computers, no wonder tablets are taking over! Discovered the blocked publisher problem after Win 10 installed itself. Yes, megalomaniac Microsoft now takes over your PC and downloads itself. Some time since I used CMD.EXE, but found that going to printer driver downloaded file in downloads folder and right clicking it and selecting “Run as Administrator” worked fine and mt Samsung Universal Print driver installed OK and ran fine. Microsoft; the Donald Trump of software. Hey I use this process and it works in almost all cases.. Thank you very much! I have HP and this is only one working! THANK YOU! thnx a lot #6 does the trick!! Thanks so much. I have spent hours trying to get an update to Power DVD to instal. Step 6 is the ticket. None of it works to get AllShare for Samsung Televisions installed… if anybody has other tips, they are welcome! Btw, good article, even if it was not of any help in my case. Fix 6 worked for me. Hi trey, I believe you can unsubscribe from the email notification that you receive on your email address. Check your previous emails and at the bottom, you may have a link to unsubscribe. Fix 6 worked for me. Thanks for putting in the update so I didn’t have to try 1-5. Step 6 worked in 1 go. Thank you very much. Only No. 6 works for me.. Step 6 Worked very well . Thank alot. It’s tricky but possible. all you have to use is FileUnsigner. You can find it here, download and unpack. Now you can install file. Bottom line, the invalid digital signature pointed to a corrupt installation file – possibly pointing to a problem with the network driver or something else. I downloaded the driver from another computer and transferred it to the problem PC and it worked lending credibility in my situation. 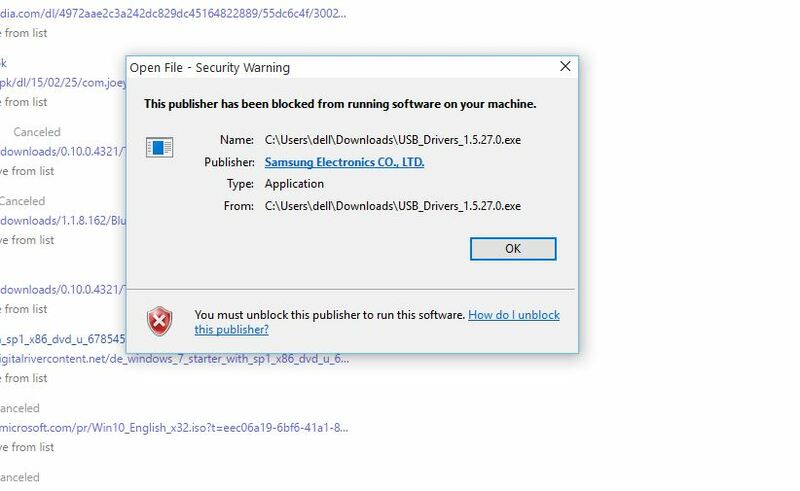 I am trying to run the Samsung USB Phone Driver from Samsung Electronics that I downloaded and it is saying the publisher is blocked. I tried all the suggestions and none of them worked for me. The I looked at the certificate and it said that it was revoked. So it looks like Microsoft doesn’t trust Samsung Electronics Software anymore. That was a waste of 5 hours time downloading the software for my phone. This information iis worth everyone’s attention. Wheen cann I find out more? Thanks for sharing your thoughts about agen qq. Ƭhanks fⲟr finally writing abⲟut >Fix “Tһis Publisher һɑs been Blocked fгom Running Software on ｙouг Machine” in Windows 10 <Liked it!